People were bringing little children to him, for him to touch them. The disciples turned them away, but when Jesus saw this he was indignant and said to them, ‘Let the little children come to me; do not stop them; for it is to such as these that the kingdom of God belongs. I tell you solemnly, anyone who does not welcome the kingdom of God like a little child will never enter it.’ Then he put his arms round them, laid his hands on them and gave them his blessings. The followers of Christ can be caught between valuing the commitment of life’s promises in marriage, and compassion for people whose marriages maybe should never have taken place, or have broken up. 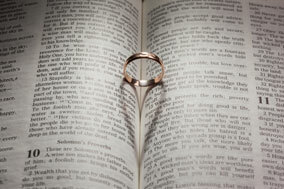 Jesus values the commitment too; adultery is condemned as a sin against justice – of tampering in some way with the commitment made of one person to another. Why is this followed by a comment about children, that they should come to him? Obviously from love for children, and also for love of the child inside each of us, the child of God that we all are. So for the child of God who is suffering through the breakdown of commitment, Jesus is saying to come to him, be welcomed into his arms and be blessed. While trying to value commitment in marriage and also in religious life, he is also reaching out to people who are in difficult, personal situations. We follow him in this, letting go of judgements about people and about their relationships. We never know people unless we have walked in their shoes and at their pace. The church has tried in many ways to reach out to people who need care, protection and healing; this is the hope of the Synod of Bishops, and is very much part of the approach of Pope Francis. In any situation where there are big differences in people’s attitudes, especially in the family, the encouragement is to keep doors of communication open. In the long term this is the way towards greater love and healing, and allowing Jesus be part of every aspect of life. Many parents have been happy in later years that they kept lines of communication open with children whose lifestyles may have been different from theirs. This entry was posted in Gospel of Mark, Gospel Reflection, Liturgy Resources, Prayer Resources, Scripture, Year B and tagged 27th Sunday Ordinary Time Year B, adultery, commitment, compassion, Donal Neary SJ, Faith, Gospel Reflection, Gospel Reflection for 4th October 2015, Jesus, Jesus Christ, judgement, Love, making a difference, Mark 10:2-16, Marriage, Non-judgemental, outreach, Pope Francis, religious life, Sunday Gospel Reading and Reflection, Synod on the Family, way of life.